Last August I took my family to Searles Leisure Resort in Hunstanton for the first time. Actually, Searles was not our intended destination at all. We had hoped to spend a few days at Kelling Heath, Weybourne, but had left the booking too late. 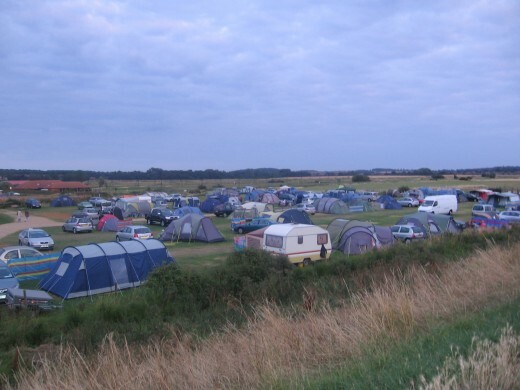 There was no availability - in fact, camping in Norfolk was experiencing a sudden upsurge in popularity and the majority of campsites were full to last-minute bookings. A quick phone call to Searles told us that they had spaces on the overflow field. My son liked the look of the website - especially the pool area - so we decided to give it a go. It wasn't expensive for a tent without electricity (which is all you can have on the overflow field). I did, however, have my reservations, mainly because it was so different to my perception of how camping should be. Whereas Kelling Heath had secluded pitches, trees and beautiful heathland surrounding the site, Searles looked so concrete, with too many rows of caravans and lodges, orderly paths and not enough grass or trees. The entertainment looked a bit cheesy, too - and 'cheese' is something that we don't really do. Still, since we only live in Norwich and the drive was fairly short, we thought we'd give it a go - mainly just to please the children who were looking forward to a break under canvas. The beautiful sunset over the beach at Hunstanton - in fact, this is the only place in the east of England where you can watch the sun set over the sea. 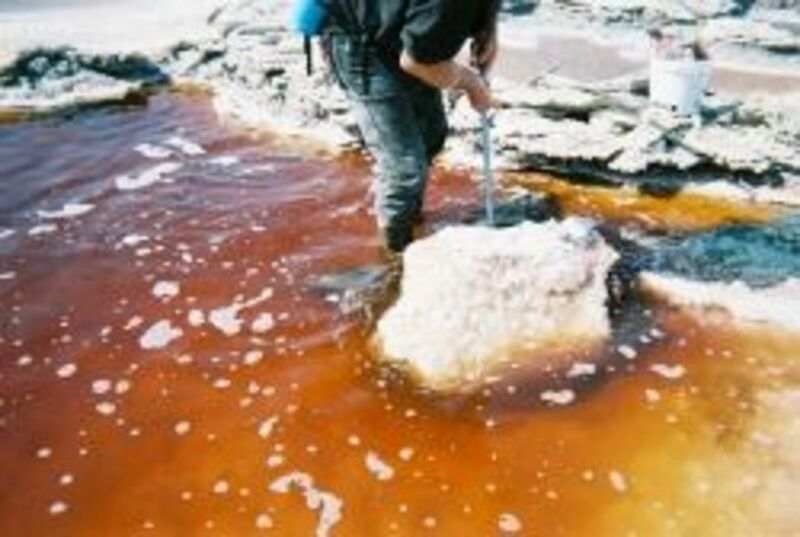 This is due to the land facing west, over the Wash. In actual fact, we were not disappointed at all. We had a good few days, and my oldest son (ten at the time) absolutely loved it (the youngest did too, but he is more easily pleased). I must say that Searles is a very good choice if you have children that are becoming a little more independent. They can have a lot of freedom at Searles, within a very safe environment. And whilst it is not like Kelling Heath - it has much more of a holiday resort image - it is definitely worth a visit. Searles is not naturally stunning like Kelling, but it has its own merits which make for a good family break. It is very well maintained, has excellent facilities and amenities and is a great base for exploring the surrounding Norfolk countryside, including attractions such as Sandringham and Castle Rising, and beaches like Brancaster. Searles is also very good at entertaining the children, which is, in the end, paramount to the enjoyment of the parents. A view of the overflow (stable) field, looking down from the top of the slope leading to the beach. Upon arrival at Searles Leisure Resort, we checked in at reception and were given directions to the overflow (or stable) field, for which we had booked. Upon booking, I had been slightly dubious about pitching on the overflow field - I couldn't help but think that it would be inadequate compared to the regular pitches. On the overflow field, there are no electric hook-ups, which didn't bother us as we did not have anything electrical anyway (we would have liked to buy a fridge but couldn't afford one). 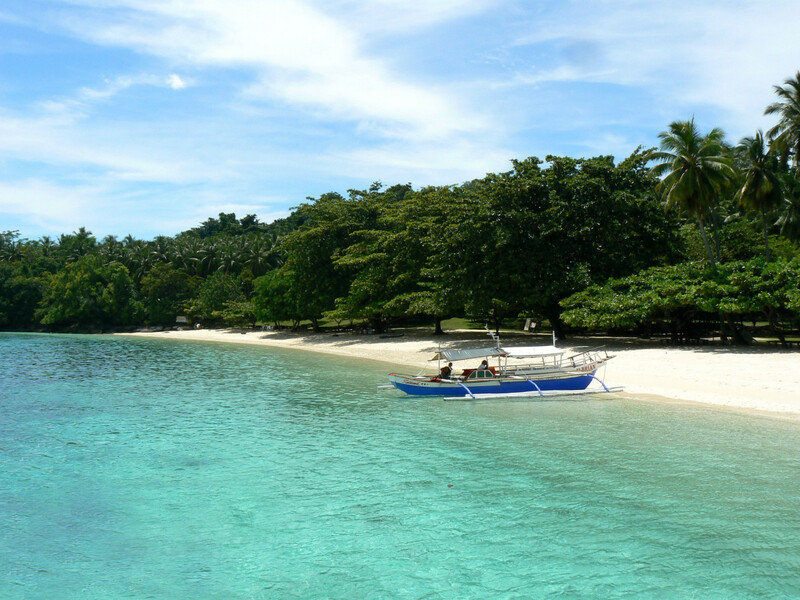 It is also a fair distance away from the resort entrance and all other amenities, such as the supermarket, pool area, mini golf, eating establishments and entertainment (if you have very young children you are probably going to require a pushchair or else you will go mad). As we drove towards the field, we passed the regular pitches, separated by well kept hedgerows and orderly paths. The stable field is aptly named. It houses small stables where horses are kept at night - during the day they spend their time grazing in the next field. I believe these are the same ponies used for rides on Hunstanton beach, although I am not certain. Whatever, camping in a field beside grazing ponies was a pleasant experience - my little boy liked watching them being led from the stables to the field and back every day. The stable field might seem basic, but it has nearby bathroom facilities (although at the time of our visit they were not underfloor heated, unlike all other blocks on the resort), a water point and wash up areas. In the end, we were actually rather pleased that we didn't have a regular pitch - although attractive and well-maintained, regular pitches seemed cramped in comparison, with less space around them for the kids to play ball. The stable field does not have the orderly resort roads running through it - in that respect, it is more the kind of camping experience that we are used to. In fact, we had the best of both worlds - a simple field with a large pitch (you can pitch anywhere and pitches are bigger than the serviced alternatives) and superb facilities around the park. Of course, most guests do not stay in the stable field, which is reserved for busy times when the rest of the resort is full. 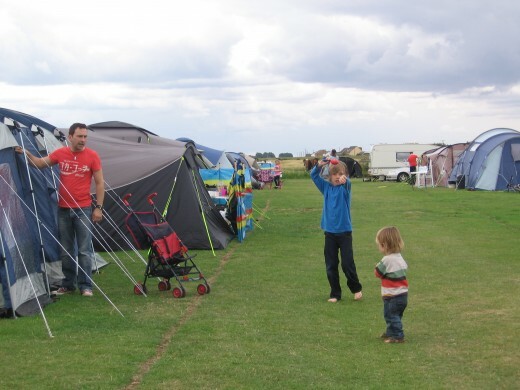 You can choose from camping in one of the regular, serviced pitches enclosed by well-kept hedgerows; bringing your own caravan or hiring out a luxury lodge or static caravan. Whilst the stable field depicts a bit of wildness, the rest of the site is manicured and orderly - care is taken to ensure that everywhere is kept clean and well-maintained, and the staff that we encountered were friendly and helpful. (We had to ask for assistance immediately upon arrival because we had locked our son's bmx bike to the back of the car and left the key at home.) I thought that the luxury lodges looked absolutely fantastic, and definitely would have loved to stay in one myself had I wanted to spend that much money (I might have considered it had it been a main holiday and not a mere hour-and-a-half from our house, but could not otherwise warrant the extravagance). My first shot of the sunset. 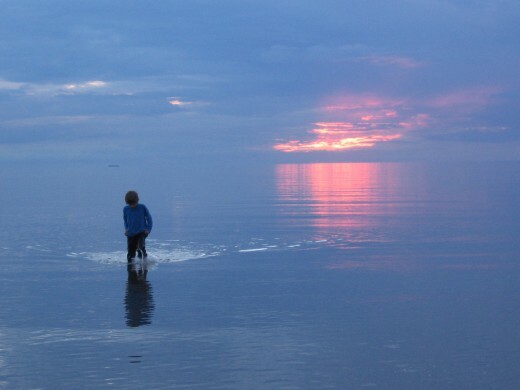 My son, standing on the beach. 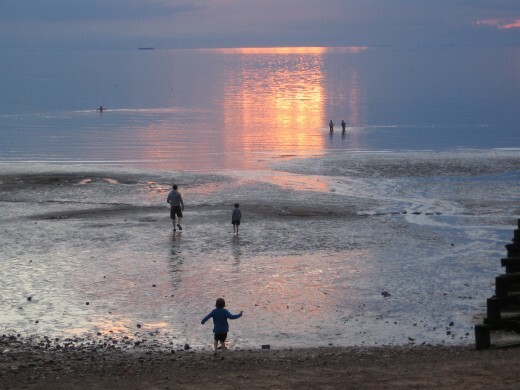 Children messing about on the shore as the sun goes down. 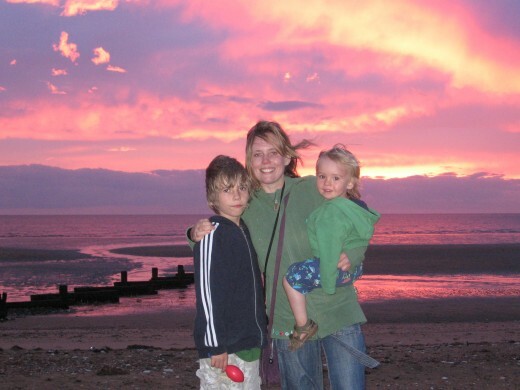 During our stay, we made the effort at dusk each evening to stand on the seawall, or the beach, and watch the sunset. It became a bit of a ritual, as it seemed to be for many others. From Searles, the beach is quite literally on your doorstep - all we had to do was walk to the edge of the stable field, up the slope and over to the beach. 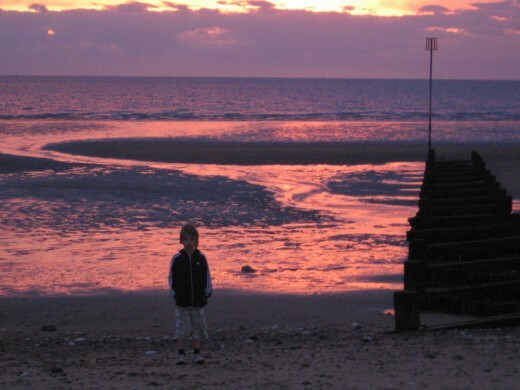 So why is watching the sunset on the beach such a ritual at Hunstanton? Of course, sunsets can be beautiful and spectacular wherever you are, but the coastal stretch around Hunstanton is rather special. 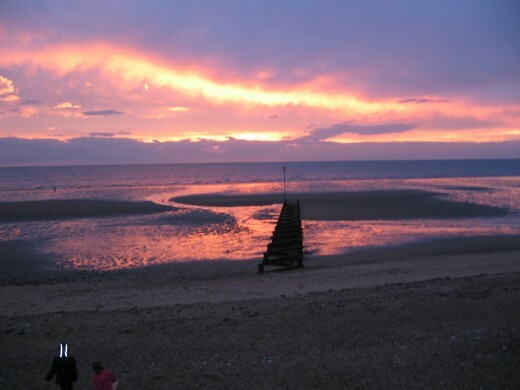 In fact, it is the only place in the East of England where you can watch the sun setting over the sea. This is due to the beach actually facing west, over the Wash. On a decent night, the sunsets are magical - I spent time trying to take the perfect shot, while the kids (along with other children) played about in the shallows as the sun sunk and made way for the night sky. They are lovely memories to be treasured. To be perfectly honest, Hunstanton Beach is not the best beach I have visited in Norfolk, especially where natural beauty is concerned. By day, the main tourist area at Hunstanton Beach is really nothing to write home about - it lacks attractiveness and is not a patch on many of the other beaches along the Norfolk Coastline (although the beach at Old Hunstanton and the surrounding coastal area is much better, and you can see the well known striped cliffs and explore rock pools filled with sea-life). Where we were, across from Searles and down towards the fairground, the beach was bit stony, a bit tacky and had pony rides, too much fast food and the unattractive (though fun for the kids) fairground. Classy, it was not. But by night, it somehow transformed itself into something special - as though the sun has cast a magic wand over it. Older children love biking around the safe complex - it gives them freedom and a feeling of independence. Mini golf is another facility to try - I didn't know my two year old was going to be so into it. 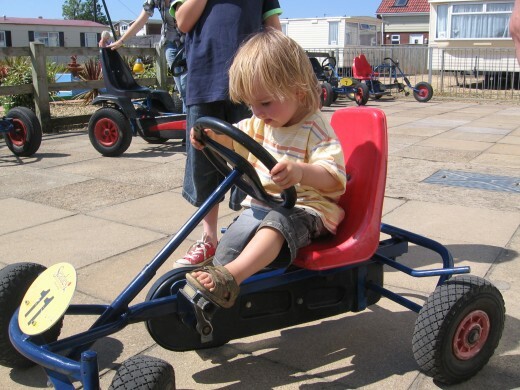 The go-karts which are so popular with children of all ages - there are karts with varying numbers of seats. The picture here is slightly poor on quality but I included it anyway as go-karting at Searles is something every child wants to do. 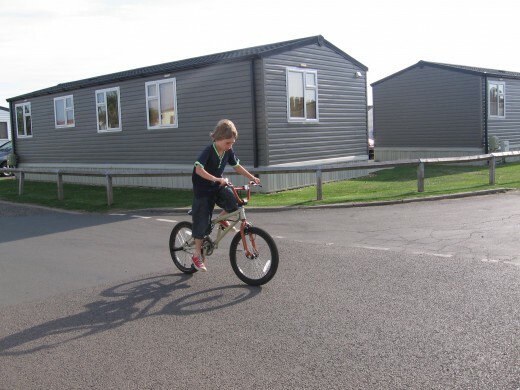 Searles has facilities in abundance, which certainly helps to prevent the children from getting bored. 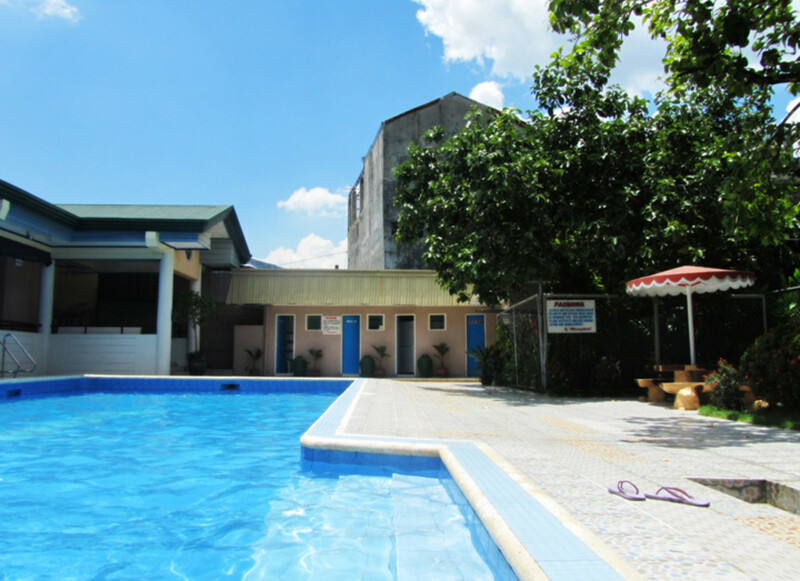 The swimming area is fantastic, with two outdoor heated pools (children's pool and regular pool) to take advantage of (In fact, there is also a third, indoors pool if the weather is chilly). Young children will like the separate paddling pool with sprinkler as well. The pools are patrolled by lifeguards at all times of opening, and there is a fun water slide which kids love (I tried it out and it's pretty fast). The slide is not open all the time, however - I didn't quite manage to work out if there was any pattern to its times of operation. The area surrounding the pools is nice, with free sun loungers and tables and chairs where you can eat and drink. We also tried out the indoor pool when the sun went in and we were all too cold for outdoors swimming. There are a couple of playgrounds at Searles - these are most suited to the younger children. (My son was ten at the time and wasn't really interested in them). Kelling has a large adventure playground, but at Searles the play facilities are more traditional, sticking to the swings, slides etc. When we were there the playgrounds were hardly ever empty, even as it was starting to get dark. They are a great place for children to make friends, or even to just play about with brothers and sisters. Go-karting at Searles is something every child, big or small, wants to do! 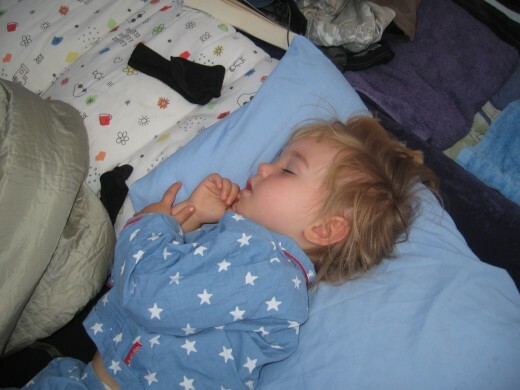 My son went on and on about it until he did it - in fact, he did it twice. Bigger kids don't need any supervision - they can set off around the park and go pretty much anywhere they like (a few areas are out of bounds) while you take a well deserved break. Young children might not be able to pedal themselves, but you can hire family karts. I did the go karting and it was great fun. My oldest son set off in a single kart and we followed in a family sized one. It's very good exercise for the calf muscles! At one side of Searles there is a huge field which can be used for anything, and off that field is an enclosed, non-grass football pitch. It's not enormous, but it is extremely popular. My son spent huge amounts of time here - he didn't know any of the other children, but whenever he turned up he was included in the informal games and had a brilliant time. In fact, whenever we were cooking dinner in the tent, or washing up, or doing some other mudane task, he would disappear off to the football pitch on his bike and sometimes didn't come back until it was nearly dark. I thought it was great - bucketfuls of fresh air and plenty of exercise! There is a small mini golf area near the shop, which (to my surprise) my two-year-old son became rather obsessed with. Golf for the more serious is also available, at the Country Club, if I recall correctly. This was not, however, a facility that we used. When we first arrived at Searles, we bought a lot of provisions from the on-site shop. It is quite well stocked, and you could certainly buy enough to cook all your meals, should you want to. However, it is cheaper to make a trip to a local supermarket like Sainsbury or Tesco - we reverted to this, although we still used the shop for some things, due to our lack of fridge. NB: These is not the full list of facilities at Searles, but just those that we used ourselves. Multiple eateries can be found in the pavilion area near the pools, as can the night entertainment. 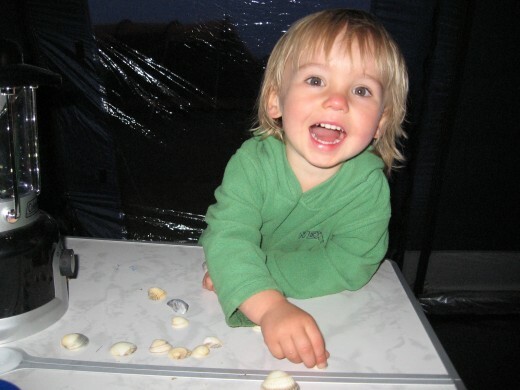 In the tent at night, playing with shells we found on the beach. During our stay at Searles - slap bang in the middle of the school summer holidays - the weather was fairly warm and sunny. Searles is, however, quite a windy place - situated right on the coast with little to protect it, it is very exposed. I did read about the wind before we set off for Searles, and when we arrived I realised the descriptions were accurate. This did not, however, spoil our holiday - when we were there the breeze was quite warm and we quickly got used to it. I suppose it gave us a sort of rugged, outdoorsy feel, and it did make cooking difficult on occasion (I was envious of the campers with windbreaks). I don't know if we felt the brunt more on the stable field, due to the lack of hedges to shelter behind - perhaps, perhaps not. I can't remember exactly, but I don't recall it being windy all the time - some days were calm and others less so! In any case, the wind did not lessen the enjoyment of our camping trip. 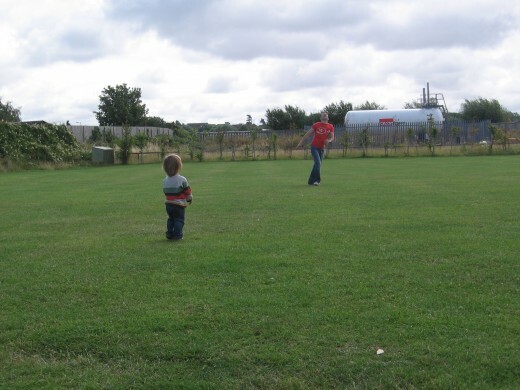 The huge field at Searles, perfect for any kind of ball game, kite flying or just running about. To the right is an enclosed football pitch - my son spent a lot of time here, joining in with games. 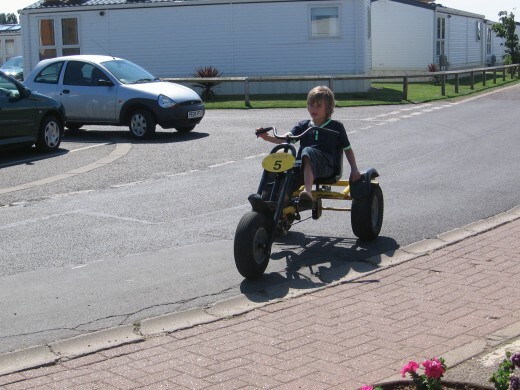 Sitting on a go-kart - this is a still image, little children can't pedal these themselves and so need to be a passenger on a multiple seat kart. As I mentioned before, both my children were really taken with Searles and would love to go back. 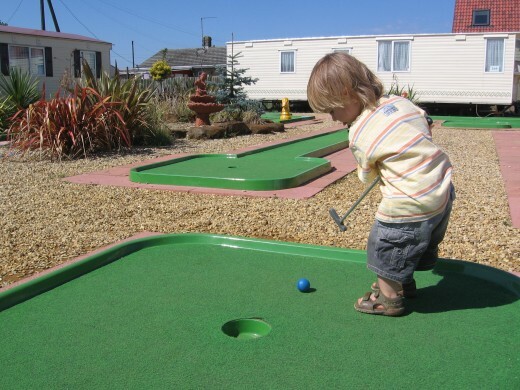 The well kept grounds, helpful staff and great amenities helped to make family camping easy and fun. Oh, and the bathrooms and washing facilities were some of the cleanest I have ever seen when camping (and I will admit to being quite fussy). A wonderful article and magnificient pictures. Thank you.